Here at Achievemint, we’re passionate about helping people lead healthier lives. We reward people for doing activities with the health apps and fitness trackers that they already use, and for participating in meaningful research about health. We immediately loved Pokémon GO for the way it motivated people to get outdoors and engage with their cities and neighborhoods. Our burning question was — could the Achievemint platform definitively prove that Pokémon GO is changing behaviors, increasing activity, and improving health? Our burning question was — could the Achievemint platform definitively prove that Pokémon GO is changing behaviors, increasing activity, and improving health? 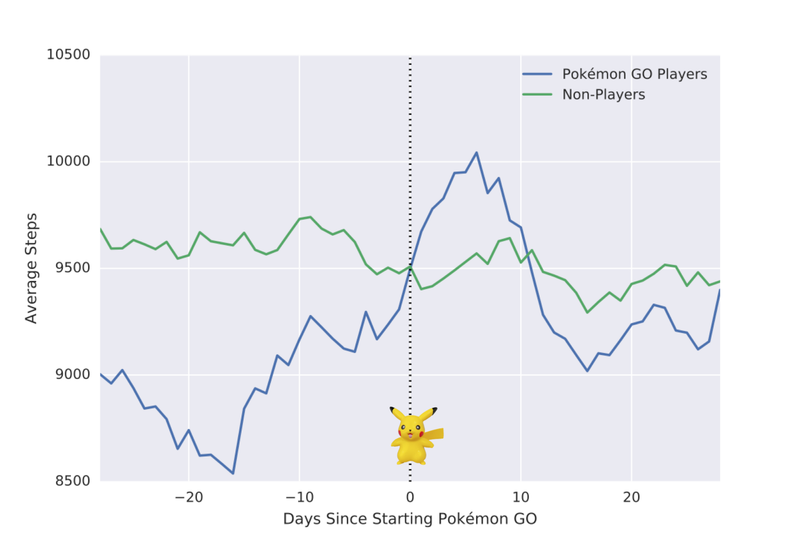 Measuring the Pokémon GO Effect. We teamed up with Dr. John Torous from the Division of Clinical Informatics at Harvard Medical School, and with the help of 1718 Achievemint members, we launched a project to help uncover if Pokémon GO might improve overall health. We integrated survey information with step data from many of the participants, so that we could compare activity in the 30 days before and after they said they started playing. 340 of the people who were playing Pokémon GO also completed an in-depth 25 question online survey about their use of the game and their health (participants could optionally report things like their weight, mood, etc). We also had a group of people who said that they aren’t playing, and we looked at their steps before and after the launch date of the game. Pokémon GO players are walking around more. On average, Pokémon GO players increased their step counts by about 1,000 steps/day. The effect may wear off. Significantly increased step counts only lasted for about 2 weeks after the date when people reported that they started playing the game. This was only during 30 days that we looked at so far, so we’ll continue to investigate further. Overweight players see the most benefit. People who reported a BMI over 30 increased their step count by 2x over those who reported a BMI less than 30. So, Does Pokémon GO Improve Overall Health? The potential negative health effects of Pokémon GO have been pretty clearly, and comically, demonstrated — walking into telephone poles, stepping into traffic, and the like. Just search #PokemonGOFAIL. That said, it’s exciting to see any new technology engage 21 million people a day, and it’s especially exciting when that engagement translates into real activity gains — as our data shows. Pokémon GO players are more active, at least for a period of time, and that increased activity can make people healthier. Pokémon GO players are, at least for a period of time, more active and that increased activity can make people healthier. We’re digging deeper here in the coming months to understand the long-term effect of Pokémon GO and the link to other potential health benefits. For now, however, we’ve learned that playing Pokémon GO can impact one’s mental health — 23% of respondents said that playing the game improved their mood. While our initial suspicion was that these happier participants were those who were also the most active, an analysis of the data revealed that these players walked no more or less than players who reported no mood benefit. The upshot? Extra activity is an important aspect of overall mental well being, but far from the sole determinant.